It’s definitely no secret that I love a good polka dot fabric and when I found this fabric a couple of years ago in Walthamstow for only £2/m I just had to get some. To me, it was screaming TRENCH COAT!!! 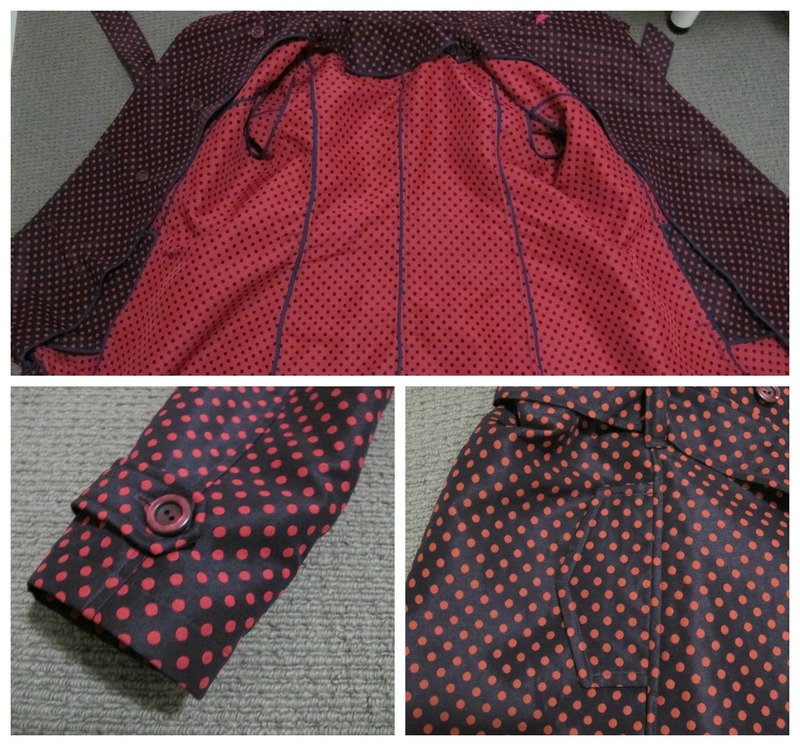 It’s some kind of polyester, thick-ish, reversible and pretty much windproof. I actually made most of this at the Melbourne Sewaway in June last year, but I didn’t finish it as there were a couple of fit issues, the binding was taking FOREVER and I ran out of thread! I procrastinated for a while after I got home and eventually finished it late last year, just in time to not wear it all summer! Typical!! 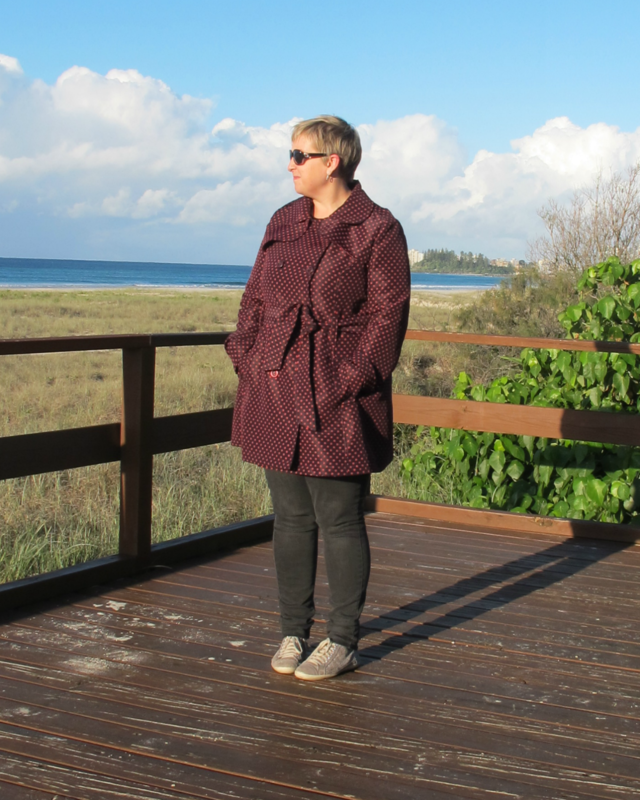 So, now the weather has cooled sufficiently and this coat has now become a bit of a staple. I wear it every day to and from work, it is the perfect weight to shelter from the slightly cool mornings we have here in winter. A normal winter morning in Brisbane is about 12-15°C – yeah not much to complain about huh? 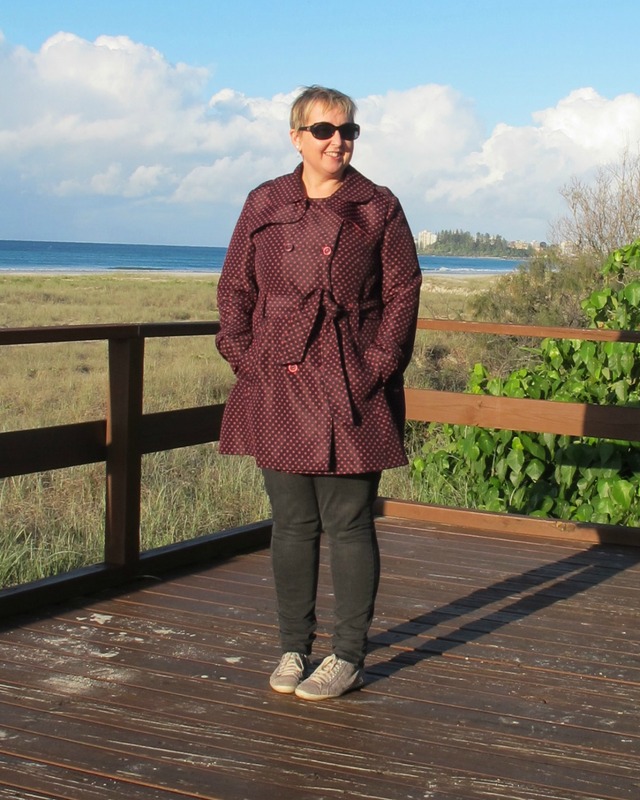 The pattern is Robson Trench by Sewaholic with only a couple of modifications. The most obvious being the 4-5″ I took off the length. I did this for a couple of reasons, one, I am only 5’2″ so I normally shorten everything anyway, additionally I felt a knee length polka dot jacket might be a bit much. I also question the proportions of a knee length jacket on my figure. The other alteration I had to do was take a serious amount of width out of the hip area. I cut my pattern based on my shoulder and waist measurements and can only assume I disregarded the hip measurement (even at the time I couldn’t remember). I had tried it on during the construction process, but it was only upon belting that the size became really evident. My fabric is firm-ish so the additional fullness poofed out really weirdly. Word to the wise, try this on for size with a belt, well before doing all the bias bound seams. Ask me how I know…grrr. Unpicking all that bias and re-attaching it = not fun!! I ended up taking it in about 5″ around the hips. My final recommendation is to use a lighter fabric for the lining of the storm flaps. I used a cotton, mostly because I forgot to cut the lining pieces, but I am glad I did as in the fashion fabric it would have been too thick. All being told, I really love this jacket. It probably doesn’t go with everything in my wardrobe given the colour and print, but I figure being outer wear that isn’t too important. 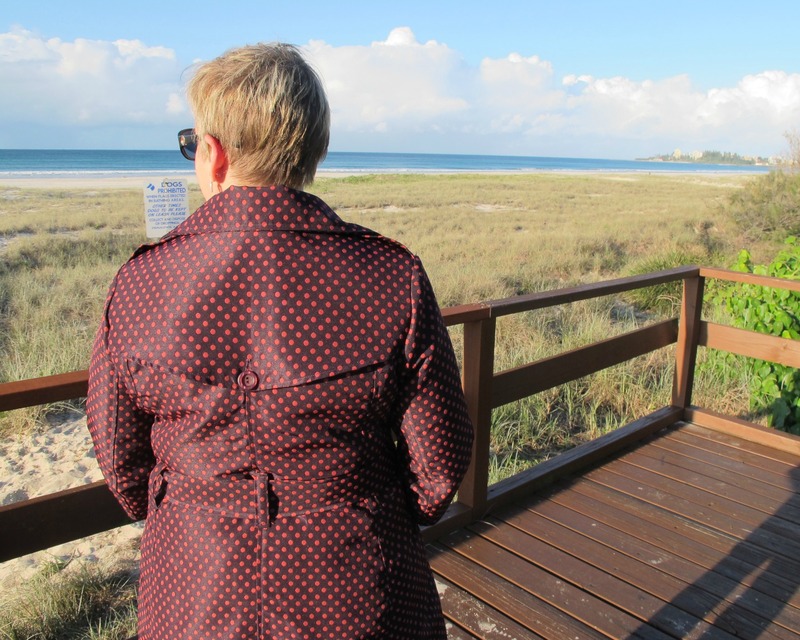 I had to giggle the other day though when I was wearing this coat over a polka dot dress – is there really such a thing as too many polka dots?? Thanks Maria, I much prefer this length! You can never have too many polka dots! Gosh I love this coat. Perfect length, perfect fabric. Definitely does not look homemade!! It does look funny with my navy polka dot umbrella! In your case, there is no such thing as too many polka dots! Whenever I see polka dots I think of you. So great to see this finally up on the blog. Huge effort. Gorgeous coat. And I personally LOVE outer coats that are dramatic & a big contrast the rest of the wardrobe. There is nothing more striking than a sensational jacket – you rock this one. Why thank you lovely lady!! Wow, this looks amazing! Perfect fabric for this design, and I love the shorter length you did. Never too many polka dots Liz! This coat is all sorts of awesome. The finishes are perfect. No wonder you’re pleased. Super pleased with this, even if it was a lot of effort to make. I’m even contemplating another one!! I’m in the midst of making a Robson too and I know what you’re talking about with the firm fabric & hips issue – I’m debating removing some width too… Haven’t decided yet. I love your shortened version – it looks really lovely. I saw your floral Robson, it is super cool with the leather! Haven’t read the post yet as I’m hopelessly behind! I was s happy to finally get to see this one on 😀 It is truly smashing and so glad you hemmed it up- it sits beautifully! Your Robson looks fantastic. Unpicking the bias, what a journey! I’ve just got the button holes to put on mine and I’m done! I’m with you though, if I make the pattern again I would line it rather than binding all the seams. I am sorely tempted to make this in a neutral. I love the look of the binding but am still not sure I’d go there again! Fantastic work! It also shows up what a great pattern maker the Sewaholic ones are! 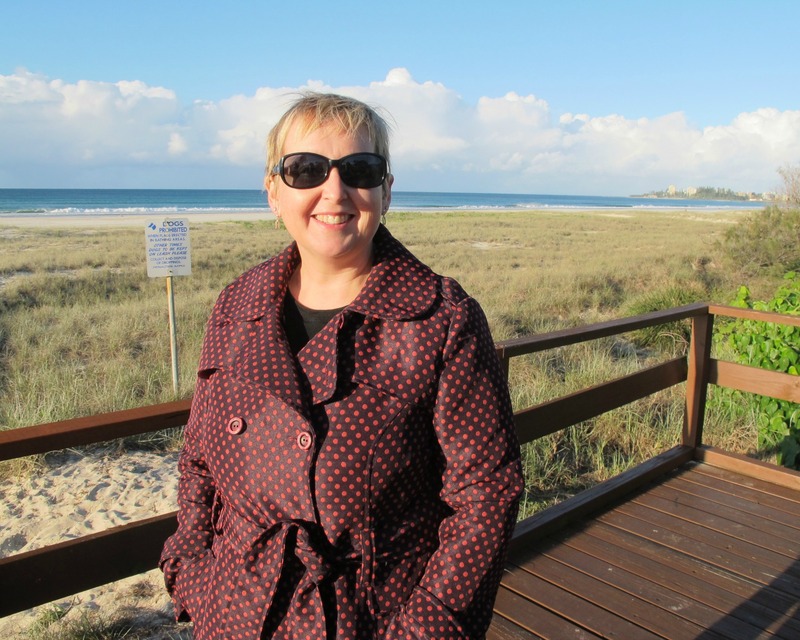 WOW and yes, it’s not that cold in QLD for a thick jacket! This is lovely! It’s been cold the last few days but even then this was enough, it cuts out the wind beautifully! Thanks! Polka dots are a Lizzie staple! I don’t think you could ever have “too much” on the polka dot front. Amazing work on this jacket! I have only just ventured into jacket territory so I think it will be a fair while before I ever tackle something this intense. This isn’t a difficult make, just takes a lot of time. You could do it easy!! This is so fabulous! It really looks awesome on you! Shortening it was a good call- the length is perfect! Thanks Sonja, it was worth the effort! Such a cute jacket! Looks so well made too like all your other projects. Perfect for our Brissy winter! Glad you finished in time and no doubt can wear it for another week before it heats up again hehe. Thanks Erin. I have been wearing this almost everyday on the commute – it’s the perfect weight!